Expect, plenty of your favourite throwbacks, from 90’s to 2000’s + Old school Hip-Hop, RnB & All the best number one tracks since the 90’s. DJ Natty behind the decks week in week out! Arrive early or get ready to wait your turn – the door can be difficult depending on the amount of people waiting to get in. Strict door policy with ID scanner, please have ID with you to avoid difficulties – strictly over 18’s. Big groups – we operate on 50/50 female/male policy. 6PM – 1AM, Free until 10pm ★ Then £10 Age restrictions: 18+ ID will be required on the door! Please be advised to arrive 30 minutes before last entry time to avoid additional door fees. 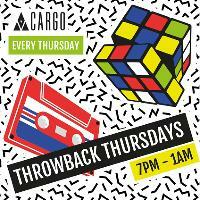 Cargo tickets are valid until 11pm only!